From the editors of Kiplingers Personal Finance Magazine, . From auto insurance to zoning regulations, Know Your Legal Rights guides readers over hundreds of common legal hurdles. This ready reference is written in understandable language, not legal jargon. It will help readers recognize when they have a legal problem and decide if and how they can resolve it on their own. If they can’t, this book shows them how to find qualified legal counsel. 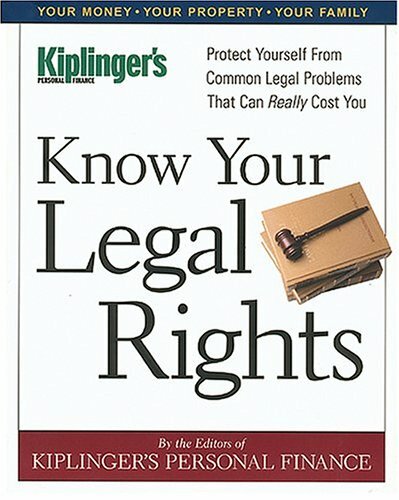 Know Your Legal Rights also explores the legal aspects of truly personal subjects, such as marriage and divorce, parental obligations, live-in rights, medical dilemmas and estate planning. It includes helpful resource information, including lists of advocacy groups, trade and professional associations, and federal and legal agencies where you can turn for further help.